The West Highland White Terrier, often referred to as a "Westie" is a small breed characterized by its long, soft white coat and cute, inquisitive face. The Westie can be plagued by skin conditions that cause the dog to itch. Excessive scratching can lead to infection and related complications. Stopping a Westie's itching in its tracks early in the game is desirable. Bring your Westie to the veterinarian for a checkup if it has been scratching continuously. 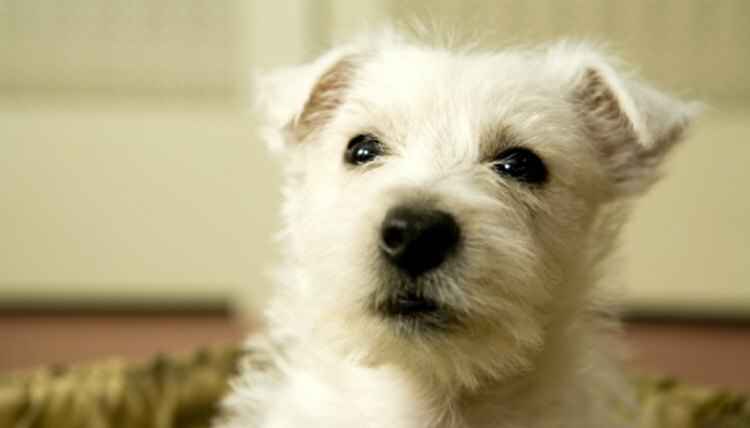 One source of itching in Westies, like other dogs, is fleas. Treat your dog with a monthly flea treatment, a liquid placed on your dog's skin. A flea collar can also keep the pests away and help your pet stay itch-free. Treat your Westie for malassezia dermatitis, a yeast-based skin infection if your pet not only itches but smells bad and develops a black oily quality or crusting of the skin. Shampoo the dog twice a week with an over-the-counter, anti-yeast shampoo, allowing the suds to stay on the skin for 15 minutes before rinsing. Continue the weekly baths for several weeks until you see the skin beginning to heal. Give your Westie prescription oral medications, including ketoconazole if the itching is not resolved through bathing or flea products. The veterinarian will tell you the dosage information based on your dog's weight. Mix the tablet into canned dog food if your dog suffers from gastrointestinal distress while taking the medicine. Speak to your dog's health care provider if the itching does not abate. Food allergies contribute to atopic dermatitis, a non-specific skin condition characterized by itching and dryness. The Westie Rescue of Southern California recommends that the breed avoid eating wheat and soy products for optimum skin health. Your vet can recommend a premium dog food that may improve your pet's condition. What Are the Treatments for Itchy Skin in Dogs? Does Vitamin E Help Pets' Wounds Heal?